A long known statistic is that about 10% of all seniors aged 60 and up have dementia. Thus the prevalence of dementia is about 10% of all seniors. Early onset Alzheimer's disease occurs in people under the age of 65. While not common, it does occur in people as young as their 40s and 50s. Late onset is at or over age 65. 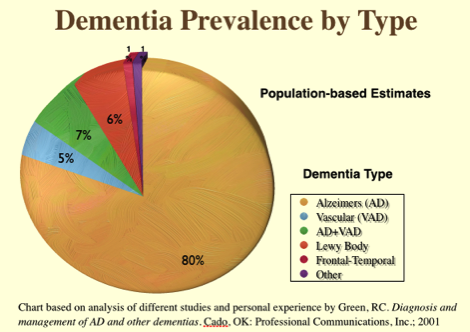 What we know is that the prevalence of dementia in much higher in older groups of people. In fact, increasing age, not heritability, is the biggest factor in AD as it occurs in about 6% of people aged 65-74, but 47% of people with AD are 85 or older. Alzheimer's Disease (AD) is, by far, the most common cause of dementia accounting for up to 80% of cases. The vast majority of dementia is caused by Alzheimer’s disease (AD, as much as 80%). The second most common cause is Vascular dementia (VD, about 5%) e.g., multi-infarct disease or many microscopic strokes in the brain. About 7% of dementia patients have both Alzheimer’s and Vascular dementia, which are then said to be co-morbid. Lewy Body dementia (LBD), that occurs with Parkinson’s disease, accounts for around 7% and Frontal-Temporal Lobar Dementia (FTLD) accounts for about 1%. All other causes (including the many reversible ones) constitute about 1% of dementias. 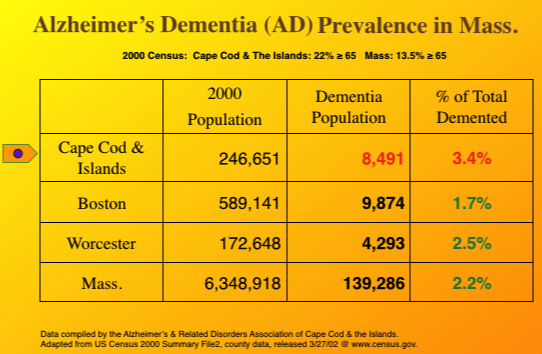 Here's a chart of how many people likely have Alzheimer's Disease on Cape Cod in Massachusetts. You can calculate if you know the age levels per population in your area. Most counties in the US have statisticians evaluating such statistics. Obviously, dementia occurs more in areas with older residents, such as our retirement communities on Cape Cod. The take-away from this is that Alzheimer's disease is by far the most common cause of dementia, followed by stroke-related Vascular dementia which combine to cause, perhaps, 90%+ of all dementia's.